Great Britain's men booked a Paralympics wheelchair basketball quarter-final place with a 71-55 win over Japan in their final pool game. Japan paid the price for an error-strewn first two quarters at the North Greenwich Arena. Terry Bywater scored 19 points but admitted that Great Britain took things easier in the final two quarters. "We were playing such good stuff, it was hard to keep up the intensity," he told BBC Sport. "We conserved a lot of energy, but anyway, it was another great win for us." Reigning champions Australia, USA and Canada are favourites for gold. Great Britain will discover who their quarter-final opponents will be following the conclusion of the pool rounds, later on Monday. GB wheelchair basketball - who's who? 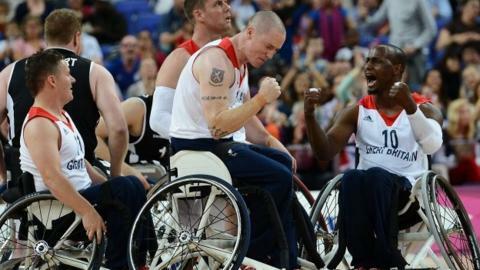 Read more on Paralympics 2012: GB wheelchair basketball men - who's who?